While door knobs and drawer pulls may first come to mind when cabinet hardware is mentioned, we first think of drawer slides and door hinges. Cabinet hardware and/or accessories put the ease of use into well designed cabinetry. 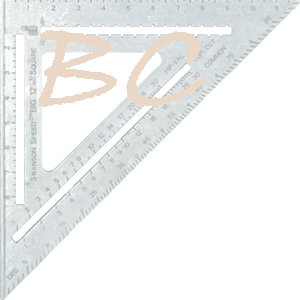 We have a vast knowledge of drawer slides, hinges and accessories and are able to explain what will work best and where. 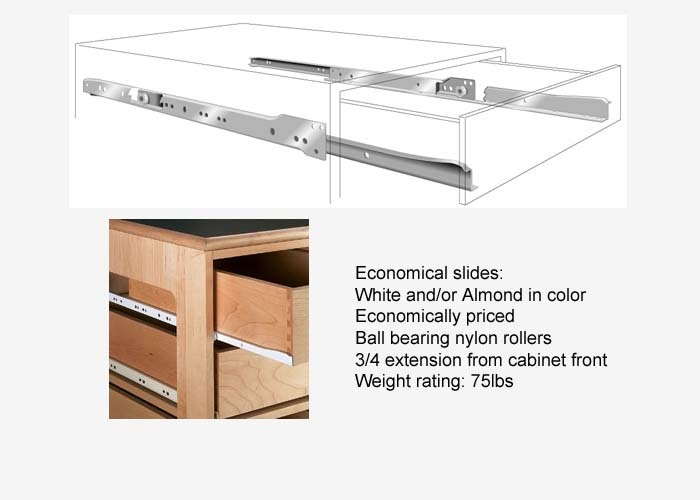 As a custom cabinet shop, we have set our standards high using full extension ball-bearing drawer slides and Blum concealed hinges. 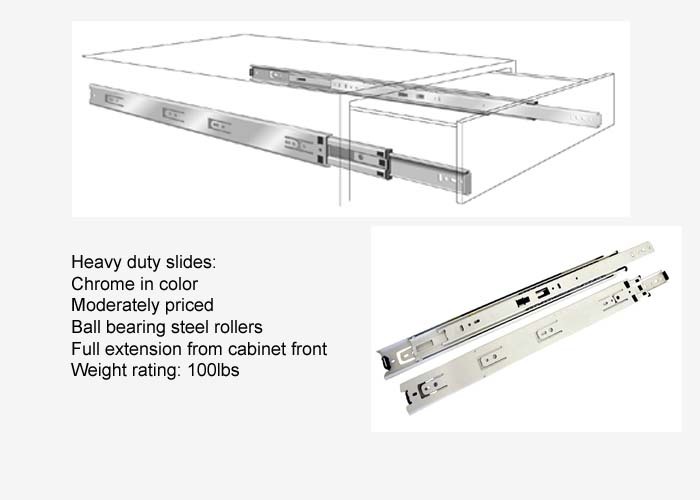 The most common type of drawer slides used as an industry standard for custom cabinetry today are Full Extension Ball-Bearing slides. 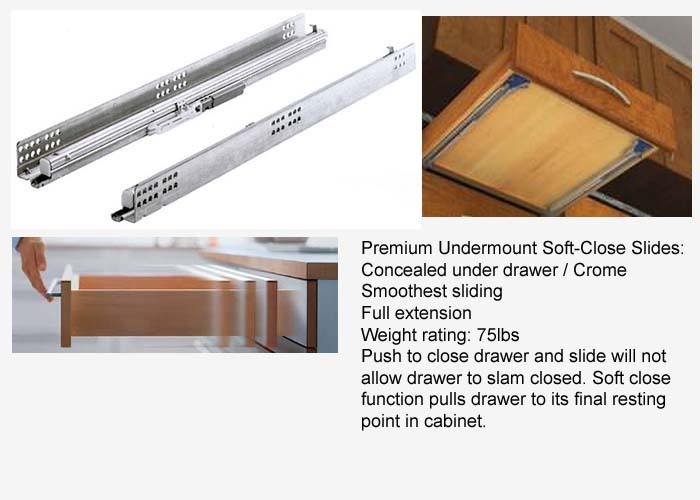 When choosing a type of drawer slide, consider how easily you want it to glide in and out. Full extension allows for full access to the entire drawer box while 3/4 extension allows for 75% visible access and 25% of the drawer is still tucked in the cabinet. Soft-close drawer slides are also available and always a nice feature to add. When sliding your drawer closed, the soft-close slide will catch it and pull it the rest of the way in. No more slams! Hinges vary by application. The 2 most common applications are inset and overlay. Inset hinges are inset into the actual frame of a cabinet while overlay hinges are in front of the cabinet frame. 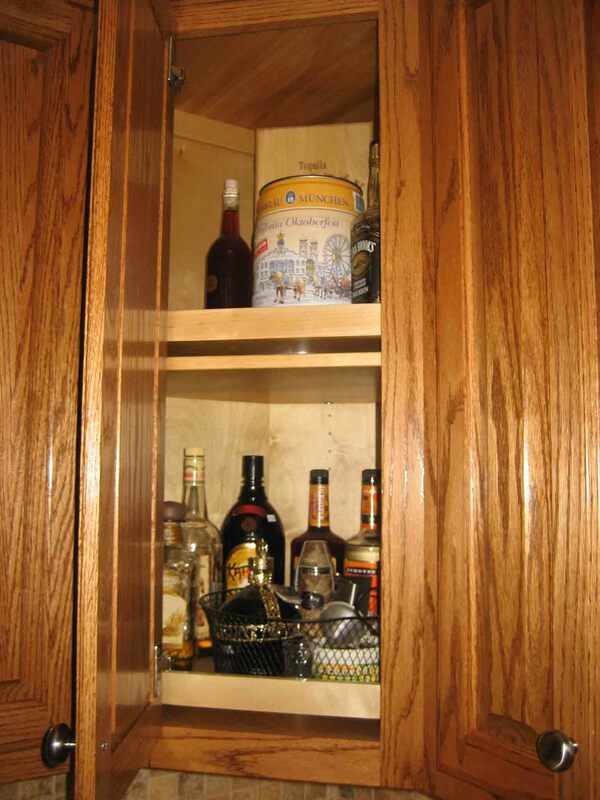 A common misconception is that inset hinges must be used to provide the narrow 1/8" reveal between cabinet doors. Generally, hinges include the hinge itself and a baseplate. The baseplate and cabinet construction most commonly determine the gap or reveal from one door to the next. European concealed hinges are most commonly used as today's standard. Our preferred brand is Blum. Blum makes a solid hinge with many options. Additionally available are soft-close hinges. Similar to the drawer slides, they catch the door and slowly pull it shut. Lazy Susans are always a good option for corner cabinets. While it may seem like they waste space, they actually allow more ease of access to the back of a cabinet. We use all wood lazy susans as they are much sturdier than plastic ones. Other ideas for a corner cabinet may be drawers, standard cabinets or bottom to top doors with adjustable shelves. While these are all based on preference, we do provide several options. 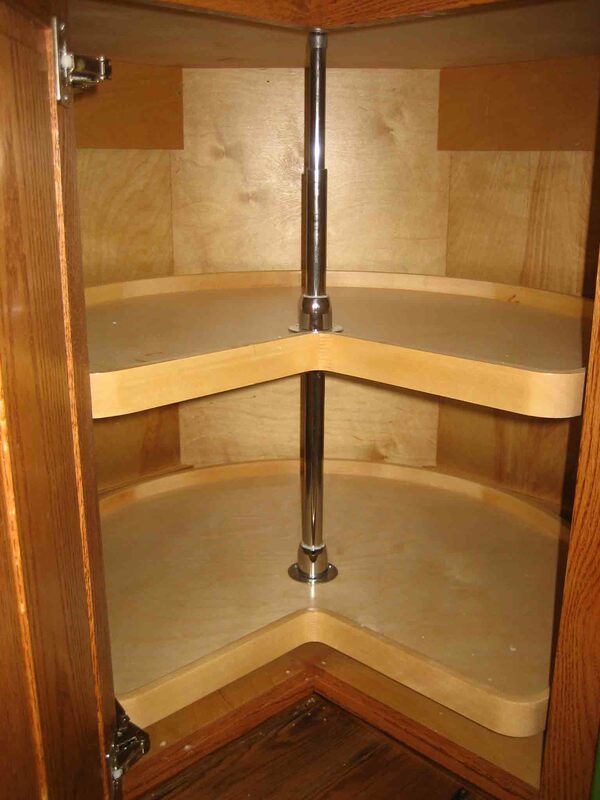 Lazy Susan shelves are also available for upper corner cabinets. Yes, we provide rubber door bumps with all of our cabinetry projects. While many custom cabinet makers neglect this very small luxury, we intend to make sure even the smallest details are thought of. We also use, as a standard, metal "L" shaped shelf pins. We guarantee our shelf pins will not break with normal wear and tear as plastic ones seldom do. For added support, the shelf pins we use have holes to actually secure the pin to the adjustable shelf. There are many many more common accessories made to fully utilize every bit of space in a custom cabinetry project. 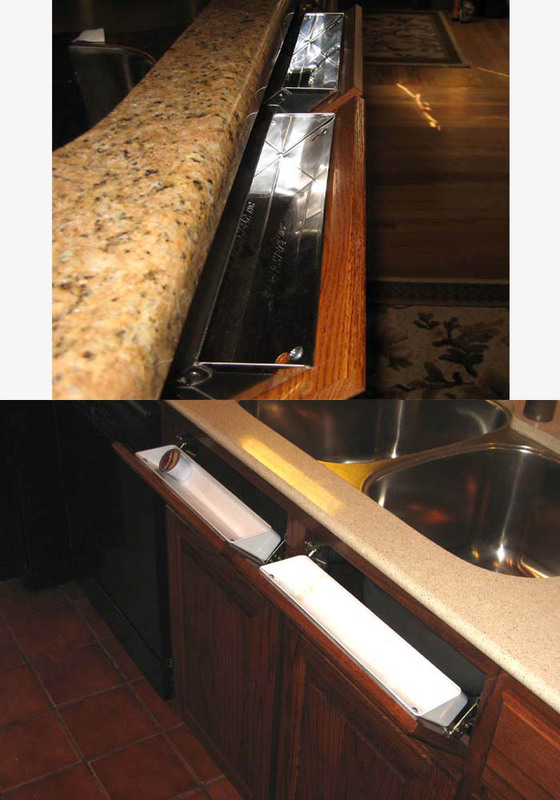 The most common include sink trays, trash bin pull-outs and pull-out shelves. Through our experience, we want you to know all of your options and will help integrate any new ideas you may have.